FRONTLINE/World reporter Clark Boyd (center) and producer/cameraman Josiah Hooper film in the Acholi Quarter. Reporter Clark Boyd reflects on what it's like to be a radio guy on your first assignment for television -- reporting for FRONTLINE/World in Uganda. It's been two days of hard driving. James, our driver, keeps washing the windshields of our van, because Josiah can't film with dirty windows. We've been out to a small town in eastern Uganda, but now we're back in Kampala. I can barely make out my initial impressions though the haze of charcoal smoke and red dust. Today, we visited an Internally Displaced Persons camp on the outskirts of Kampala. I recorded this audio journal about our visit. My name is Clark Boyd, and I have no business being on television. At least, that's what I was telling myself until a month ago. I live in Boston and normally cover technology for PRI's The World, a one-hour international news program co-produced by the BBC World Service in London and WGBH public radio. I've been in public radio now for more than a decade. Then, FRONTLINE/World caught wind of a story I'd covered for radio. It's about a new microfinance organization called Kiva. Microfinance isn't new, but Kiva's approach to it is unique. The group uses its Web site to directly link lenders with a bit of cash to entrepreneurs in developing countries. I did the original report on Kiva earlier this year. FRONTLINE/World asked if I'd be interested in doing a report for them. I said, "Sure, I can do it sometime in the next few months." The response: "Actually, we need it done by the end of October." Without further ado, we started in San Francisco. That's where Matt and Jessica Flannery, the husband-and-wife team that founded Kiva, are normally based. We had five manic days, and nights, of shooting in the Bay Area. It was the first bit of television I'd ever done. All I kept thinking about was that old saying, "Hey, he's got a face for radio..."
Kiva's first loans were dispersed in the East African nation of Uganda. So, after San Francisco, I hopped on a plane (actually a series of planes) for the 36-hour trip to Entebbe Airport outside the capital, Kampala. Jennifer Ayeni in the Acholi Quarter. Along for the ride with me was cameraman Josiah Hooper. We crossed Libya and Sudan on our flight down from Amsterdam. It was wild: 3,500 miles of nothing but desert. 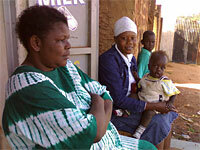 Between bad movies and fitful sleep, I began thinking about this trip -- my first to sub-Saharan Africa. When you're doing a story, you always find interesting people that never make it into the final product. Today, we had to go back to the Acholi Quarter. Josiah needed some shots looking up at the whole quarter, which meant driving along the road beneath and scouting things out. He finally decided that he needed to get up on a roof. We chose a building that was home to a tiny medical clinic on one side and a small retail store on the other. 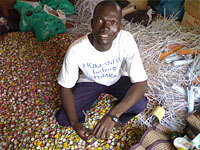 Peter Ndello among recycled products. The owner of the store didn't have a problem with us getting up on her roof. We didn't need to pay her. But, her daughter wanted to chat with me about journalism. Her name was Jennifer Ayeni, and she had just got her journalism degree from Makerere University in Kampala. She studied for three years, passed all of her exams and was eager to get a job working for a local newspaper. But she'd had no luck -- she told me that for many young people in Uganda, there are no jobs in the fields in which they trained. So, Jennifer is stuck working for her mother in the retail store. She recently applied for a job with one of the big daily newspapers in Kampala. She didn't get it. Later on, she found out that the job was instead given to a friend of someone in the government, a person who had no journalism training whatsoever. Electricity is a scarce commodity here in Uganda. Those who can afford to have an electric hook-up at all generally have electricity, on average, only every other day. We were filming at a local NGO office today; the group's name is Life in Africa. I decided to get my microphone out and interview Peter Ndello, over what's become an all-too-familiar noise. As we left she said to me, "You see, I can't compete with that level of corruption. I have many friends who are in the same situation." Before I left for Uganda, my friend and colleague at PRI's The World, Marco Werman, reminded me of an article he had given me a few months ago. The article is entitled "How to Write About Africa," and it's written by the Kenyan author Binyavanga Wainaina. It appeared in Granta magazine. You can read it here. In the Absence of Asphalt! In my travels for PRI's The World, I'm often asked the question: "But aren't you scared to travel now with all the terrorist threats?" My standard response -- and I really do believe this because it's true -- is that I have a much higher chance of getting killed in a traffic accident, especially in the developing world. That's why I couldn't resist giving you a flavor of life on the road in Uganda. This was recorded live on the Jinja Road. Buckle up. Now you can understand why I feel a bit of trepidation as I sit down to write this last journal entry, the one that's supposed to "sum up" my eight days in Uganda, a mere one in that sea of 54 countries. It's my time to be insightful, to make gross generalizations, and to explore how my preconceptions of sub-Saharan Africa were either confirmed or blown out of the water. It's enough to stymie any journalist who hasn't had a bucket of whisky to get the juices flowing. Sure, I can tell you things, because I'm a journalist and I'm supposed to tell you things. But here are some caveats: I saw bits and pieces of the capital, Kampala. I spent a few hours in two small towns in the eastern part of the country. The rest of the time I was sucking down diesel exhaust and dust on bad roads between these locations. My visibility was often reduced to just a few feet in front of the van. By my count, I had meaningful conversations with 0.0000008 percent of Uganda's 25 million people, and those 20 or so people all had a video camera trained on them. But perhaps I'm being too much of a contrarian. The 20 Ugandans I spoke with were, to a person, lovely people. Most of them are dirt poor, but they opened up their homes and businesses to us without a second thought. They made us stews, fried chicken, roast goat and bread -- the high-calorie stuff reserved for special guests. Best of all, they shared their stories with us. Some of those stories will make it onto television. Grace Ayaa's story (she's the peanut butter lady) is particularly compelling and will translate well onto the small screen. I wouldn't be surprised if she's featured prominently in the finished piece. Unfortunately, many good stories will get left on the cutting-room floor. That's what happens when you shoot more than 40 hours of footage for a 15-minute report. 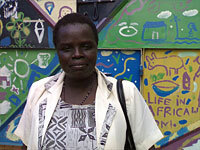 Mary fled the north when the Lord's Resistance Army ratcheted up their operations against Ugandan government troops. She's been breaking rock in the stone quarry for years now. She did get a loan from Kiva, and with that loan, she's built a small house. 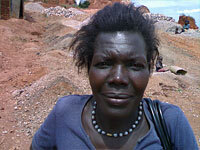 She cares for her own children as well as some orphans she's picked up along the way. The loan has helped her start a small jewelry-making business, which means she only has to break rocks in the quarry for half a day now, instead of the whole day. The cynical journalist in me says, "Well, she still has to break rocks half a day to feed herself and her family." But Mary doesn't see it that way. She's damned glad to be out of that quarry. I asked about her husband. Mary Lalaam in the stone quarry. Mary was evasive. It was unclear from her answer exactly what happened to her husband. I asked whether she'd like to be married again. She hesitated. My mind flashed to all those guys sitting around getting drunk just outside the door. I'm sure hers went to a similar place. She finally said, with a hint of a smile, "You know, I don't need a man. They just cause too many complications."